Paul travels to Chicago for another SaintCast “Man-On-The-Street” interview segment, the Saints of the Week, including St. Bede, Joan of Arc, and Justin Martyr. 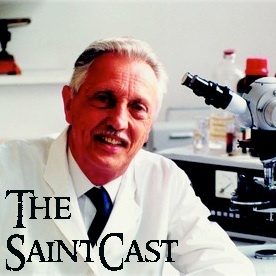 We have a saintly profile of French geneticist Dr. Jerome Lejeune who discovered the genetic basis of Down’s syndrome. The cause for his beatification was begun last month in Paris. We talk relics with the Relicman, Tom Serafin.